A distinctive form of brown sweet pickle based on apple with curry spices. Produced by the company set up in 1873 by Archibald and James Maconochie at Lowestoft, Suffolk, and later at Maconochie Wharf, Millwall, London. 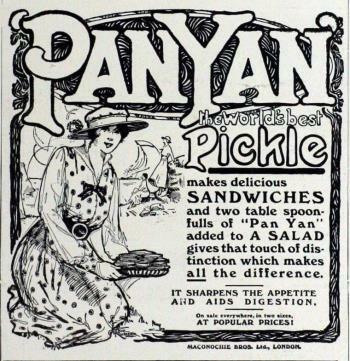 Pan Yan pickle was registered in 1903 and production continued until 2002. The final owners of the brand - Premier Foods - lost the original and only copy of the receipt during a fire in 2004, but more than one cook has attempted to re-create it from memory and the few remaining ingredients lists. A version commercially produced by Sun-Pat about 2002 listed the ingredients as; "Rutabaga, Sugar, Carrts, Vinegar, Thickener (Modified Starch), Gherkins, Acertic Acid, Peppers, Onions, Spices, Colour (Caramel), Falvourings." 1 Stir all the ingredients together and leave for 24 hours. 2 Put in clean and sterilised jars. 3 Tastes better after 2 weeks storage in a cool dry place and makes about 7 x ½ lb jars. 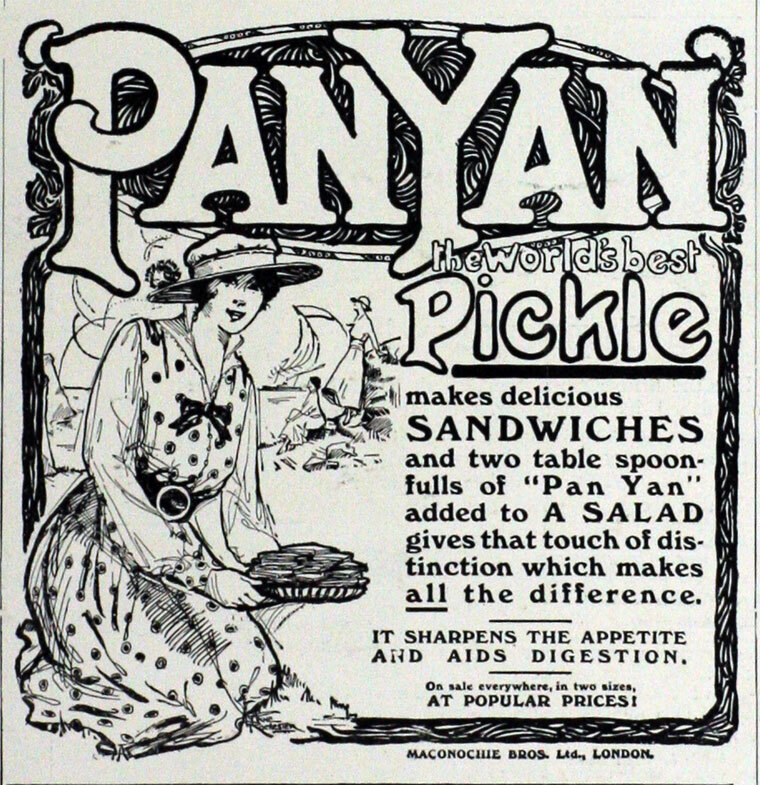 Add more curry powder to taste - it’s the curry powder that makes this pickle The Real Pan Yan Pickle!